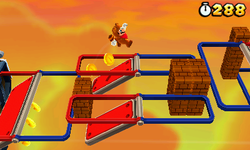 Special 6- Airship is the Airship level of Special 6 in Super Mario 3D Land. It is based off of World 4-Airship. The player starts on a small Airship next to some Red-Blue Panels, which lead to the next Airship that has a Warp Pipe that goes to the room with Boom Boom in it. After defeating Boom Boom, another Warp Pipe will appear. In the next area is another Flip-Swap Platform segment and then the Goal Pole. Star Medal 1: Behind some Brick Blocks next to the Warp Pipe that leads to the Boom Boom fight. Star Medal 2: On some Red-Blue Panels right after the Boom Boom fight. Star Medal 3: Floating above a Spike.